Nous raises $600k to help drive its SparkProfit stock market prediction platform. Lending Club selects the NYSE for its IPO. Currency Cloud releases Connect API 2.0. ID.me announces acquisition of Perkla. InComm partners with CardCash to integrate its online gift card exchange at InComm’s retail partners nationwide. Compass Plus completes its TranzAxis integration with Klarna. 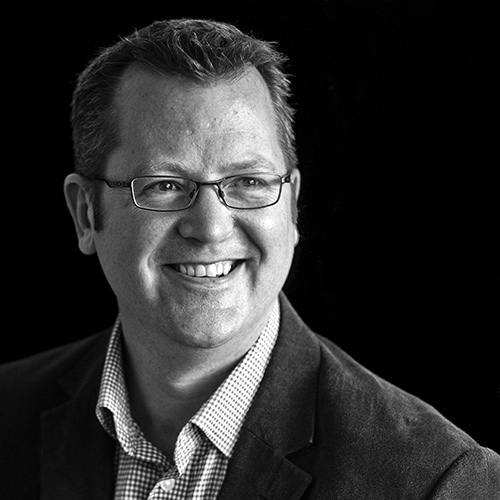 ID Analytics names Scott Carter Chief Operating Officer. 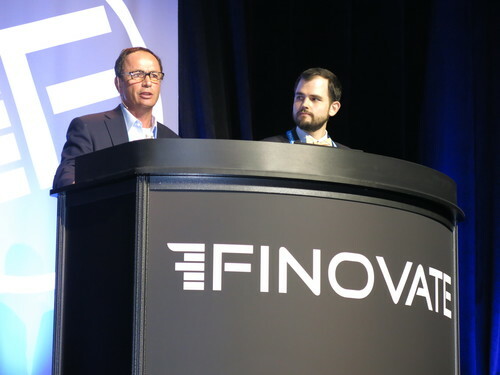 Check out Finovate Debuts: NopSec. CAN Capital closes its first capital markets asset-backed notes offering. Coinbase now available in 6 additional languages. Capital Access Network listed among Information Week’s top U.S. technology innovators in 2013. FIS announces analytics programs for customers. Google Wallet launches on the iPhone. Swipely now managing $1 bil in annual sales, 1 yr. after entering payments market & launched Swipely Partner Network. Cachet Financial Solutions announces Select Mobile Lending, a new mobile app. MasterCard and Entrepreneurial Finance Labs join forces to promote SMB growth in developing nations. TechCrunch reports PayPal, Stripe, & Braintree partner with Facebook to autofill billing info in mobile commerce apps. Xero opening office in Denver. ERN partners with FICO to embed FICO’s marketing solutions within its real-time Big Data analytics platform Looop. Mountaineer Gas joins doxo to simplify bill delivery, payment, and record keeping for its 220,000 customers. Digital Insight announces new CEO, John O’Malley. ACI Worldwide acquires Official Payments. MasterCard teams up with Basware to help companies migrate from paper-based payments. KlickEx takes home Top Startup prize at Swift’s Innotribe Challenge. Crains NY Business looks at Float Money, Socure, and Capital Access Network. Western Independent Bankers selects Q2 as preferred vendor for virtual banking solutions. “Mobile Funder is a tablet-based tool enabling time-starved, “on the move” financial sales/ISO representatives selling alternative capital to small businesses with the ability to complete their sales process in one visit. Capital Access Network, a platform that provides working capital to small businesses, announced the addition of a new CFO, Shiladitya (“Shila”) Ray. In his new position, Ray will help develop long-range growth strategies. Capital Access Network’s former CFO, Daniel DeMeo, is now its Chief Executive Officer. In May of this year, Capital Access Network provided U.S.-based small businesses access to $66 million. In the month of July it provided access to more than $74 million. To learn more about Capital Access Network, come see its live demo in New York at FinovateFall next week. 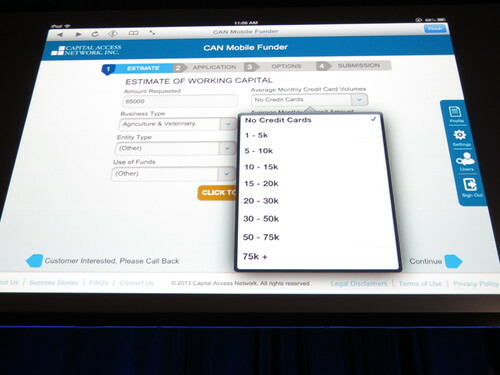 Or, watch its FinovateEurope 2011 demo. We hope you’re enjoying our Sneak Peek at the presenters of FinovateFall 2013. You can learn more about our upcoming event here. And if you’ve missed an installment of our series, here’s a handy index to this year’s innovators. Today we’ll introduce you to our fifth set of companies that will be demoing on the Finovate stage in September: Capital Access Network, FutureAdvisor, Instabank, miiCard, Narrative Science, P2P Cash, and StrategyCorps. So why not join us in New York for the show? Get your tickets to FinovateFall 2013 in New York here. Capital Access Network’s Mobile Funder is a tablet-based tool enabling finance reps to seurely pre-qualify small businesses for capital and submit a full application in a single visit. Why it’s great: This all-in-one tool gives small business finance reps the power to expedite decisions, close more deals, and deliver capital faster. Mr. DeMeo joined in 2010 with an extensive financial services background (Citibank, GE Capital, JP Morgan) and a history of growing businesses profitably. Meet the Capital Access Network team here. FutureAdvisor’s FutureAdvisor Premium automatically manages your current investments. Meet the FutureAdvisor team here. Instabank set out to create the most beautiful, efficient, and social mobile bank. Why it’s great: Instabank aims to unlock viral customer acquisition via Facebook and become the Dropbox of retail banking. miiCard (my Internet Identity) is the first global Identity-as-a-Service (IDaaS) platform providing trusted and traceable customer identities purely online in the digital economy. Why it’s great: Enabling purely online sales of regulated and high value products in banking, virtual currencies, payments, wealth management, lending and more. Mr. Varga has more than a 20-year career in technology and innovation. 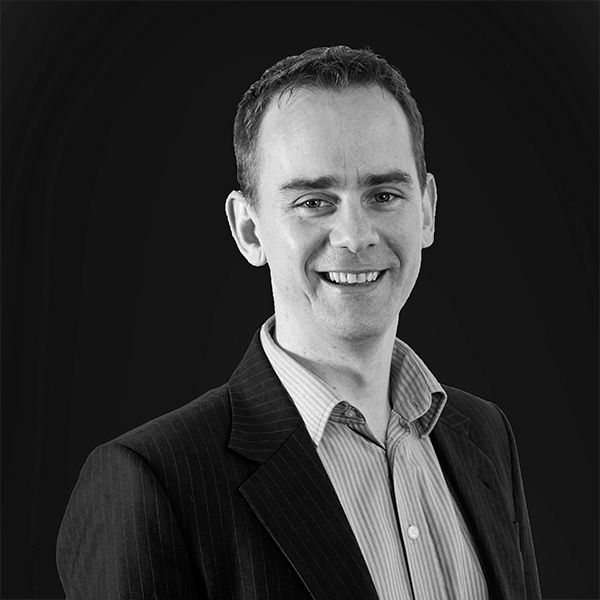 Mr. Bray has experience in bringing new innovations to global financial institutions. Narrative Science provides financial institutions with a fast, cost-effective way to analyze data and automatically generate natural language communications that answer important questions and provide timely insight. Why it’s great: Quill Financial automatically transforms portfolio and market data into human-quality communications and reports for financial institutions. Meet the Narrative Science leadership team here. P2P Cash developed an industry-standard, scalable mobile financial services solution that provides secure, compliant and transparent mobile banking to the world’s 3 billion unbanked mobile phone users. Mr Meredith has Internet, financial services, and telecommunications experience. Stanford engineer. Harvard MBA. 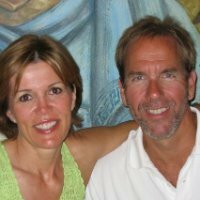 Mr. Chapman has Consulting, IT, Sales & Marketing experience. Providence College. Babson MBA. Meet the P2P Cash team here. StrategyCorps’ BaZing solution makes mobile and online banking so appealing and relevant to customers’ lifestyles they’ll gladly pay a fee for them. Why it’s great: Customers don’t like fees for basic banking products. BaZing changes that by making banking products worth paying for. Stay tuned for more from our FinovateFall 2013 presenters in edition #6 of our Sneak Peek series, coming Thursday. FinovateFall 2013 is only a few weeks away. To learn more about FinovateFall – and to register and get your tickets today – visit our FinovateFall 2013 page here. Congratulations to six Finovate alums named to the Inc. 5000 list of America’s fastest growing companies. The list included two Finovate alumni in the top 500: Kony Solutions (#28), and CashStar (#108). Prosper just missed the top 500, ranking #548. Also on the list were OnDeck (#660), Authentify (#2,328), and Capital Access Network (#4,535). Yseop selected as a finalist for the category of “Social, CRM and Loyalty” for the DMA Innovation Awards. Finextra reports: Virtual Piggy integrates with social game giant Habbo Hotel. TechCrunch reports: Braintree launches a new service called Marketplace, an API designed for mobile marketplace operators. The Sleeter Group reviews Kashoo, Xero, and others. The Guardian Money features social lending service Zopa. Transaction processing driving revenue growth for Jack Henry & Associates. 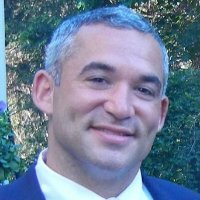 Pymnts.com interviews Daniel DeMeo, CEO at Capital Access Network, on the rise of commercial lending. Snarketing 2.0 highlights Credit Karma, FlexScore, and Moven in a column on why the financial services industry needs a “FinScore”.